Following on from my earlier blogs on how to value a professional service business and on the framing concept of a value map, it should be abundantly clear – if indeed it ever needed reinforcement – that profitability (and profit growth thereafter) needs to become your fixation. To build a professional service business of value you first need to build a profitable professional service business. Future blogs will focus on how to optimise your profitability but before we head there, it is critical that you understand how profit is derived in a professional services context. Revenue is Vanity, Profit is Sanity, Cash is Reality. In order to protect your sanity, and your future wealth potential, I need to turn your focus to how profit is derived, measured and managed in a typical professional services firm. In the case of a professional services firm, equity is typically in the hands of the managing owner(s) – partners or directors are common terms used to distinguish such owners from non-equity-owning, salaried staff. As such, Profit per Owner is the equivalent of ROE in this context. The total assets employed are effectively a combination of the ownership equity investment (time and effort of the owners) and the non-equity-owning staff. Financially, the salaries of a professional service firm’s non-ownership staff is comparable to fixed-interest, debt-financed assets in a conventional business. In future blogs, I will talk about the critical role that well presented management information (MI) has in the context of supervising a growing professional service business – oiling as it does the OODA loop (observe, orientate, decide, act) decision-making discipline of proficient executive teams. It will not surprise you to know that this profitability formula (derivation of Profit per Owner) needs to sit at the epicentre of this reporting format – with sub-levels that drill down into each of the three core aspects: margin, productivity and leverage. In terms of managing profitability, you need to focus on all three of these elements; to omit any one of them from your continuous (at least monthly) analysis is dangerous. By example, if your reports focus on productivity at the exclusion of leverage, you may erroneously reward an owner who is driving high personal utilisation and fee rates as compared to a fellow owner, with low productivity, who is highly leveraged. Yet, the latter (who is managing more junior colleagues effectively) is likely to be putting more profit into the business! With experience, and experimentation, a professional service business needs to get to an optimal profitability blend – recognising en route that it always have these three profitability levers to pull. If your business is up and running, review your current reporting system with respect to profitability MI; specifically, does the report lead the reader to a balanced view of the three sources of profit? If it doesn’t, then take immediate action to re-design the format and/or update the way your feed information is collated. Until you collect, report and manage all three core aspects of your profitability you are flying blind! It should be noted that a real guru in this area is David Maister (www. davidmaister.com). His book Managing the Professional Service Firm is an enduring read and I strongly recommend it to your professional bookshelf. Indeed, in a future blog, I will undertake a more detailed book review on this management classic. Next week, with profitability now well understood in the context of professional services, I start to look at how you can practically optimise it with business growth strategies! Hopefully, you’ll join us on this journey. It’s totally free, and you don’t have to be a Method Grid customer (though you’re more than welcome to sign up for a free trial here). We’ll be releasing a new post each week. To get each post emailed to you as soon as it’s published, sign up for the Climbing Mount Audacity mailing list below. We're sharing everything we know about how to build an awesome professional service firm (and enjoy the journey en route!) PLUS travel updates, reflections on our stumbles and general musings on our Method Grid journey. See you next week. Have something you want to hear more about? Let me know in the comments below or via Twitter. As ever, very insightful. 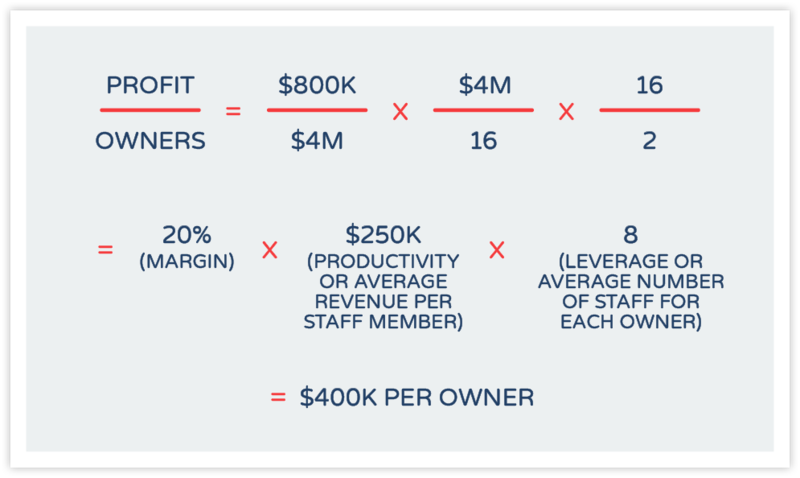 Are you suggesting that each Director/Partner/Owner manages their teams (leverage) according to this metric of the three profitability areas and then measured according to it to determine overall performance as an individual owner? Presumably we add the sum of all owners to determine overall profitability of the firm, but am interested in individual performances, as I’d like to structure our business moving forward with clear roles and responsibilities, linked with profitability and wonder if this high level approach is sufficient as a starting point? Thanks for feedback David and great question! Initially, I would focus on tracking this MI at the aggregate firm level. As long as everyone on the leadership/executive team understands this three-pronged derivation – armed with such data – you will ensure the performance-improvement discussions remain balanced (and nobody inappropriately rewarded). In terms of performance managing your senior colleagues directly, you can achieve this by measuring their individual (a) sales performance/delivery (leverage key here), (b) engagement gross margins and (c) (billable) utilisation levels. I will write a blog on the presentation of such MI in the future. Of course, per the blog, for seniors in your firm (c) is a somewhat tactical performance measure relative to the importance of (a) and (b). I should also say that the value component of productivity (i.e. your rate card) is not, necessarily, something you want others to vary. 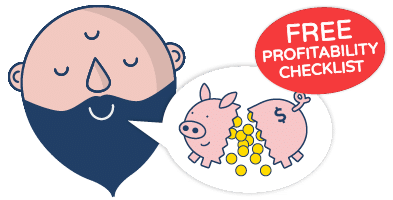 Of course, discounting off your standard rate card is always an available tactic when selling work – but – this aspect, in my mind, best treated as a strategic, whole-firm matter. What I mean by this, is that you are far better holding true to a set firm-wide rate card (constantly seeking to increase it – by dint of building a premium company/brand) and only making variation to it as a result of collective, strategic assessment cf. this being an aspect that seniors have deal-by-deal autonomy over. Hopefully this helps answer. More on the topic in next week’s blog. Many thanks for the prompt reply and indeed further information – it really is incredibly useful. Looking forward to the rest of the blog series!